Fiberfloat™ systems meet the high technical demands required of floats used in the dredging industry. 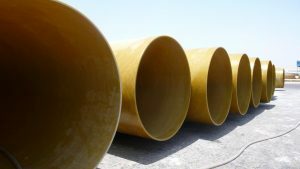 With a large diameter and high impact resistance, Fiberfloat™ provides buoyancy for floating pipelines, is strong, reliable and has a long operational lifespan. Outer jacket of reinforced thermoset resin. This triple layer technique creates a pipe which is strong, anti-corrosive, and immune to salt water and has a very high buoyancy rate of 950 kg/m³. The spherical shaping of the ends gives extra strength impact at the shoulders of the floats. Fiberfloat™ - Flex Finished with an outer jacket of Polyurethane, reinforced with a special Nylon inlay for increased impact strength and resistance to wear & tear. Fiberfloat™ can be produced with an inside diameter of 400 to 1,200 mm and an outside diameter of up to 2,600mm. The standard lengths are 5 and 10 metres, however special lengths can be tailor-made and delivered on request. For good visibility at sea, Fiberfloat™ pipes are bright yellow with blue markings.